Available from participating wholesale nurseries, Buxus varieties are sold as as potted specimens as well as in trays and as tubestock for mass planting. 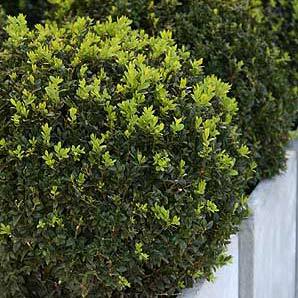 Buxus or ‘Box’ are a popular hedging plant and a number of species are used widely in topiary applications. Buxus plants vary, growth rate, leaf shape, leaf color and growth habit itself. With distinct differences between the different varieties choosing the right variety is important. Topiary is mainly the realm of B.’Suffruticosa’ . Buxus sempervirens ‘Elegantissima’ is more frost sensitive than others while B. bodenii has a shaggy growth habit. This is a plant that is available as tube stock through to advanced potted plants. Some growers also sell bare rooted plants of some varieties in winter, which is generally the cheapest option for landscapers. Regarded as hardy and drought tolerant once established, all varieties will perform best in a soil with a pH of around 6.5. Landscapers are recommended to add some lime at the time of planting. Fertilize plants in early spring and again in late summer for best results. Growers offer a number of varieties for sale and can also provide advanced plants to allow landscapers to create an instant hedge. Buxus, English Box, Dutch Box, Japanese Box are some of the most commonly used hedging plants. All species and cultivars have different qualities, growing in sun or shade, different foliage. Japanese box is a faster growing box than English Box, but Japanese Box will need more trimming. Buxus microphylla ‘Faulkner’ is a smaller growing plant used widely for low hedges as is the widely used Buxus sempervirens or ‘English Box’ perhaps the most populate ‘topiary plant’ in Australia as well as a hedging plant. Buxus sempervirens ‘Suffruticosa’ or Dutch Box is a slow growing species sometimes used in containers. Specialist in instant hedging lines sold to you by the lineal metre.Also available Hedge & Screen Packs.